Greetings everyone, it is time to update this blog and let everyone know what we are up to. 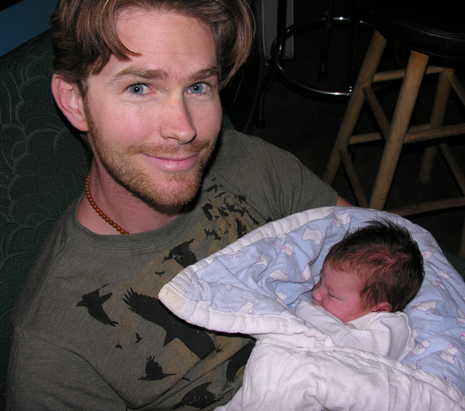 As some of you may already know, we just had a baby. Her name is Teyan Ome Ellison. She was born very healthy and at home last month. Needless to say, we are two very happy parents. In other news, we are changing the way we have been doing things. Essentially, we are taking a year off from doing shows. Our next show will most likely be the New Living Expo in San Franciscoin, April of 10’. This time off from shows allows us to focus on doing more custom projects and making unique, one of a kind items. This has been really nice and you can see the difference by just checking out some of the new pendants that we have available on the site. Mostly though, we are taking time off from the road so we can focus on raising Teyan. I have been working on some new styles of pendants lately. Here is a little preview, and you can see the rest at this link. I also have a new run of Roerich pendants all ready. Our friend Nick Edwards, who makes the great pyramids, just lost everything, including his little kitty in the “Station Fire.” If you ever thought about getting a pyramid, now would be a great time too. Check out his site Here. Today we were walking out to the orchard and saw a couple of stags hanging out with the chembuster. I was lucky enough to have the camera with us. There are a lot of faces in this photo too, if you take a deep look. Here is a link to a wonderful introductory video on Wilhelm Reich. Below is a recent special order Lemurian Rocket Cone. This cone had only gold and copper for metal shavings with a lot of fiery citrine, red jasper, garnet, and Tigers eye. Showcased in the middle is one smoky quartz point from our local crystal spot, Hallelujah Junction. In this next special order we did a project that Roxanne came up with a long time ago, chakra medallions. They each have their own energetic quality depending on what crystal was used. He is a picture of a special SP/powerwand that has the shape of one of our Rocket Cones. Underneath the crystal is a green LED that is wired to the Mobius coil giving it a slick Jedi feel to it. When the lights are out you can see it really well. Well, that’s some of the fun stuff we have been up to here. Okay, thanks for all of your support. God Bless and be well. Last fall we completed a road trip around thePacific Northwest. All four of us (Branch, Roxanne, Lukas and Rocket Dog) survived the journey in our truck and had a lot of fun. This year we are not planning on doing as many shows. We can use this time to work more at home and on our home. Part of the reason for this is that we are excitingly awaiting a baby this summer. Here are some pictures of what we have been up to. Leading up to the winter holidays, I was able to put together some custom pieces that were to be holiday gifts. The project turned out to be quite a collection. Here’s the picture (left). The obelisk in the middle was one of my favorites. It was made with all copper shavings and powders. There were also many crystals in it like citrine, jasper, carnelian, hematite and various types of quartz. Below is recent orgonix egg I made with citrine and kyanite. These two vials on the left are an interesting project that is not yet competed but essentially are going to be SP’s. I will have more information on them later; these pictures will have to be a teaser for now. Below are more custom projects. In the center is a 13’x13’ Charging plate with an Activator Disc made my Joel Bruce Walsh. This is the biggest charger I have ever made. And lastly, a project that has been one of the most interesting and challenging pieces to work on this last year. What we have here is an orgonix frame (maybe the first ever). It is a bout 35” by 28.” Inscribed into it are symbols of magic and power. Making this frame was a collaborative project with a friend of ours fromSanta Fe,Vladimir. We will also have more info and explanation on this and more like it at a later date. Check back soon. Once again I haven’t updated my blog in a really long time. Roxy and I have been working really hard a lot of different projects recently, and it seems harder then ever to update the Orgonix website. I do have some pictures to share that show a little bit of what we have been up too though. This is us at the New Living Expo. It is a great show to be apart of. We met lots of nice people, picked up some great crystals and saw a lot of old friends. 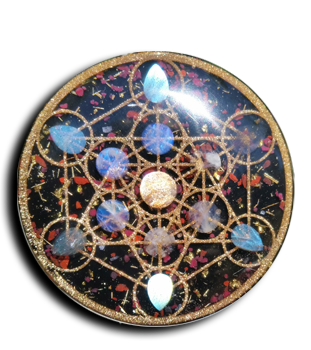 We also got a lot of great confirmations about our orgone from people we had sold to the year before. In front of us is the Ascension obelisk I made a couple of weeks ago. It has already found a new home, but I plan on making a similar one soon. This is a photo of some new creations that we made using a few new tricks. We have expanded our operation now into the world of custom silicone molds. The picture here is a typical faceted diamond shape, a crystal cluster, and a perfect dodecahedron. We have a lot of new molds now so you will definitely be seeing more of this style in the future. This is a picture of a new rocket cone I made. I rarely get them on the website these days because they usually sell at the shows we go to before I can photograph them and get them uploaded. But I wanted to put it out there for those of you who haven’t seen this kind of work from us before. This sculpture is about 11” tall and 5” wide at the base. Here we have a new 5 gallon chembuster going out to the east coast. This is a resin cast of a crystal cluster. I’ve got in image of the Hunab Ku in it. I think it is interesting how the facets of the cast reflect the image. I have always loved the Hunab Ku image ever since I first discovered it at about 14 years old while reading about the ancient Mayans. These are some really pretty pendants we did as a custom order a couple months ago. The pink one is a piece of rhodocrosite, then to the right is a piece with citrine, jade, malachite, onyx and garnet. The middle one has bloodstone and garnet; and they are all made with gold leaf for the metal component. This was a new special order Roerich pendant that was made with tanzanite, sodalite, and kyanite, black sand with ground up sapphires, aluminum and gold leaf. These are some new rocket cones I made for the Dreamtime show in Paonia. Here we have some more Roerich pendants. These may be the last Roerich’s for I while; contact me if you may be interested in any of them, they will go quick. And lastly we have a new small charger, this one has a dt crystal in it with lots of tigers eye and labradorite, one of my favorite combinations.